Volunteers are the backbone of any community-based organization and TEP is no exception. Ranging in age from 8 to 124, TEP volunteers are a vital resource in helping us to promote stewardship and enhance our watersheds. TEP volunteer opportunities are not limited to those listed below, so if you would like to suggest a project we'd love to hear from you! 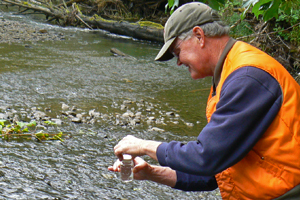 TEP supports a dedicated team of community volunteers who collect water samples throughout the Tillamook Bay watershed. Data on bacteria and temperature reflect water quality trends and help us to target enhancement activities to critical areas. Volunteers are needed for either bi-monthly sampling or as periodic back up samplers. For more information, email alix@tbnep.org. Local Watershed Councils, natural resource agency personnel, and TEP are partnering to develop a source for local riparian plantings through the cultivation and growing of native plants. 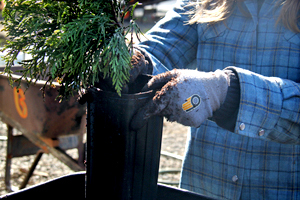 Periodic work days at the our native plant nursery, local seed harvest and planting are just a couple of ways that volunteers can help. 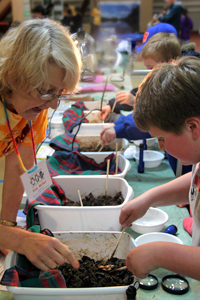 This one day event in the spring brings every Tillamook County fourth grader to a series of workshops and hands on activities that teach them about the value of clean water to their environment. 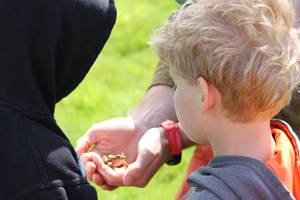 The event is aimed to complement the new Oregon Science Standards and to support local school districts with sound and exciting science education. Volunteers chaperone a class throughout the day's activities or can lead a 30 minute session with training from TEP staff, and are treated to a free lunch!